Augmented reality - the future of modern medecine and surgery? Technology advances have a big impact in our lives. The technology around tracking systems is one of the areas in constant growth, with a wide range of applications and usage. Medicine has experienced some relevant improvements in surgery procedures thanks to the evolution of new technologies. 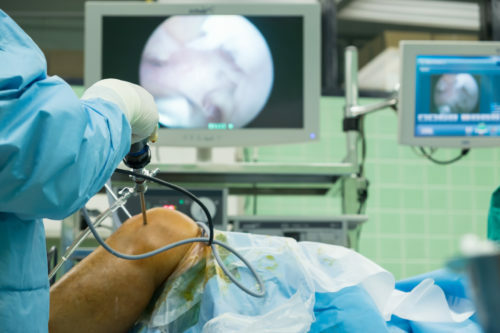 With the advent of Image-guided Surgery, surgeons get better results in medical interventions, use more precise techniques and much more reliable solutions, due to new technologies and research in this area. IMAGE-GUIDED SURGERY is a surgical procedure that uses tracking systems to get the position of the instruments used and combined the information of tracking with pre-operative or intra-operative images, so the surgeon has the chance to indirectly guide the procedure. As we can understand from this definition, one of the keys for a correct image-guided surgery is the tracking system component used. Computer-aided surgery, which have their origin in the 1980s, relied on position tracking devices. In that early stage, the position information was obtained from a mechanical digitizer, consisting of a robotic arm with rotatory encoders at the linkage nodes. The final position and orientation was resolved using forward kinematics . 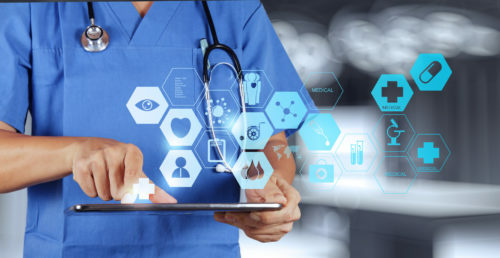 These solutions featured several limitations in a clinical setting, such as the inability to track multiple devices, as well as sterilization issues. In the attempt to find new tracking systems, other than mechanical digitizers, ultrasonic transducers for localization were used . However, these solutions did not have much impact due to its lack of robustness, since ultrasonic solutions are based on the speed of sound, which is dependent on the air moisture and the surrounding temperature. The next step in the research for tracking solutions was the use of optical trackers as clinically feasible tracking systems. The first systems used were: Optotrak 3020, Flashpoint 5000 and Polaris, all of them consisting in charge-coupled devices (CCD) cameras and sequentially illuminated infrared (IR) light-emitting diodes (LED). 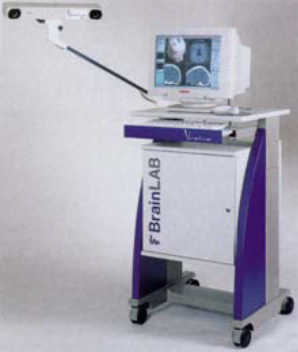 Some of them were integrated into image-guided systems, such as Neurostation, which evolved into StealthStation. 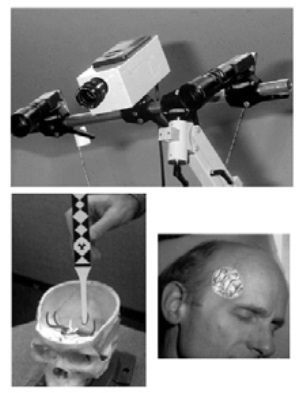 The first optical systems were wired devices, which had obvious drawbacks in a clinical scenario, so efforts were devoted to developing wireless solutions, leading to systems such as VISLAN (an experimental system for neurosurgery) and the Qualisys tracking system. Also, Polaris evolved to offer both the option of wireless and wired tracking solutions. Despite the accuracy and suitability of the optical solution in a crowded operating scenario, these solutions have an important limitation: the line-of-sight requirement between the optical markers and the tracker camera. This specific limitation urged the research of alternative solutions, in which a direct vision between the components would not be required. The alternative was electromagnetic tracking systems (EMTS), a well-known technology around motion analysis, helmet mounted displays and the animation industry. The principle of EMTS was the introduction of small coils (electromagnetic field sensors) and measurement devices with offer a good alternative in clinical settings. 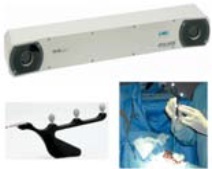 These systems were used in scenarios such as CAS (motion detection in radiation oncology), image-guided radiological interventions, endoscopic procedures and 3D B-mode ultrasound imaging . HOW ARE THEY CLASSIFIED IN THE MEDICINE AREA? 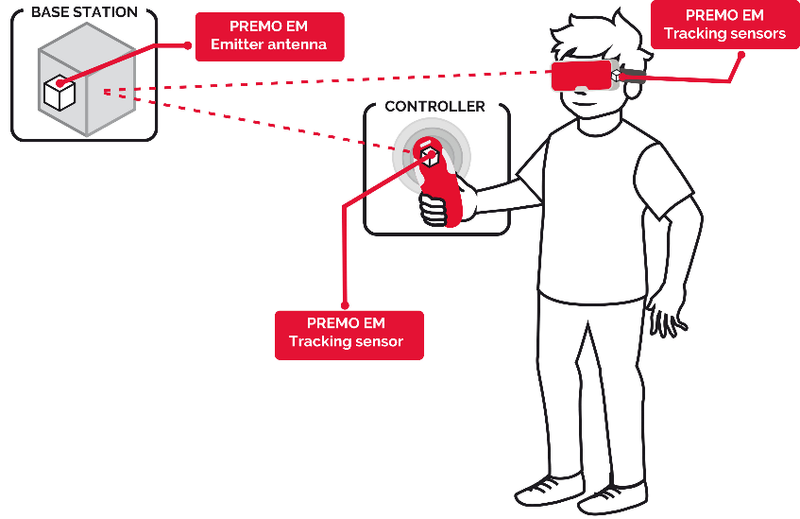 Videometric Tracking Systems. These systems use several calibrated video cameras to find specific marker patterns and follow them. Some examples of these medical systems are VISLAN and Claron trackers. b1. Active optical trackers: the markers are sterilizable LEDs operating in the near-IR range, tracked and followed by several CCD units creating a camera composite module. b2. Passive optical trackers: the markers are retroreflective spheres illuminated by cameras in the near-IR spectrum. Laser tracking systems. These systems are based on laser lights emitted by semiconductors and the reflection of these lights in rotating mirrors. 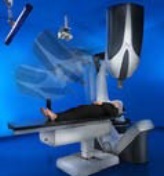 It is the optical system less used in the medical area. Electromagnetic tracking systems are based on electromagnetic field sensors and measurement devices, which can measure the rotation vs the reference emitter coils and the position in relation with the transmitter module from an induced voltage. This classification is similar to other applications and areas, and depends on the current flow and magnetic elements used. AC-driven tracking. These EMTSs use alternating current (AC) and were the first developed and used in medical scenarios. One example is the Polhemus Inc.
DC-driven tracking. In this case, rather than using AC-driven magnetic field, these systems use direct current (DC). Ascension Technology is a distributor of DC trackers. 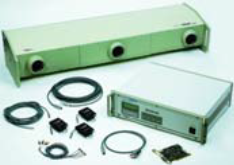 Passive or transponder system. Permanent magnets or transponders are used in these systems. The system locates or tracks the position of these magnets or transponders placed in the objects to be control. One example is the Calypso 4D system for tumor tracking. The use of different types of current flows (AC / DC) have a direct impact on the system behavior when extern metallic objects are placed near the electromagnetic emitter or sensor. In the case of AC-driven systems, these metallic objects can interfere with the continuously generated magnetic fields and produce a distortion in the measurements done. In the case of DC-driven systems, it is possible to mitigate the distortion resulting by certain metals (stainless steel, titanium and aluminum) because the magnetic field is turned on and off at a certain frequency, and that reduces the eddy current enough to mitigate it. EMTS can be a very potential element in medical and surgical scenarios. The continuous improvement of electromagnetic components will allow their usage in a more extended range of medical procedures. The main advantage of these systems is that they do not need a direct view between the elements. In medical settings, they are optimal for scenarios where the target cannot be directly visible by the surgeon (inside the body, covered by the patient tissue, etc. 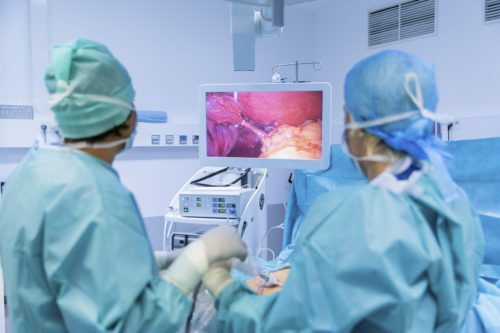 ), where the presence of a high number of professionals is required in the surgery room so the image analysis of the image recorded by a camera can be difficult. The main drawbacks of these systems are their susceptibility to distortion due to the presence of metal objects in the scenario and the limited accuracy compared with the optical systems. 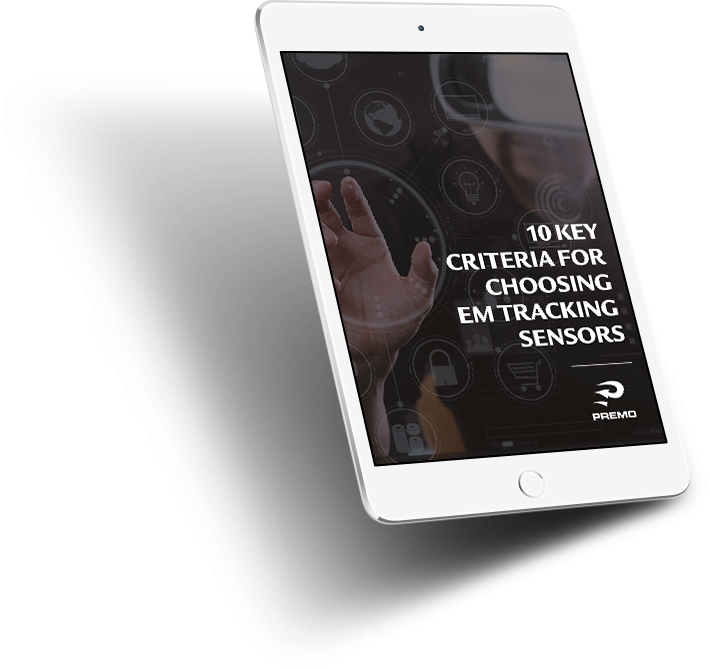 For this reason, and depending on the scenario, type of medical intervention and the accuracy level, surgical and technical professionals select between optical or EM tracking systems. Watanabe E, Watanabe T, Manaka S, Mayanagi Y, Takakura K (1987). “Three-dimensional digitizer (neuronavigator): new equipment for computed tomography-guided stereotaxic surgery.” Surg Neurol, 27(6), 543–7. Hata N, Dohi T, Iseki H, Takakura K (1997). “Development of a frameless and armless stereotactic neuronavigation system with ultrasonographic registration.” Neurosurgery, 41(3), 608–13. Birkfellner, Wolfgang et al. “Chapter 2 Tracking Devices.” (2017).